Remove the IRD cover. Use a tape measure or ruler to take measurements and mark the center of the hole to drill with a felt marker. Drill a 3/16" hole 5 1/2 inches from the right-hand side of the receiver case and 1 inch from the top of the receiver case as shown in the picture below. 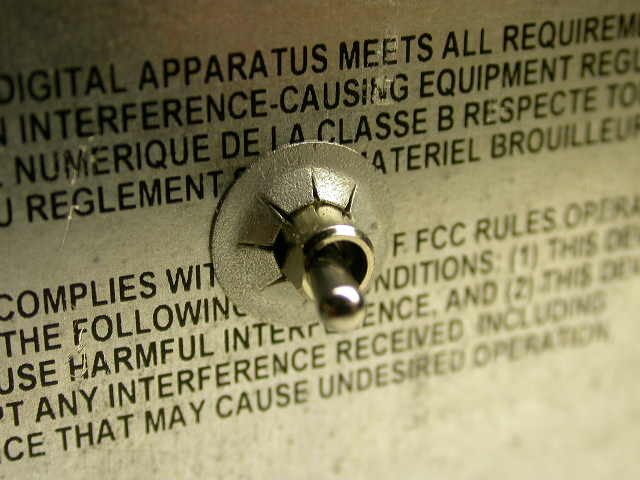 The location and size of hole in the receiver used in the above picture WAS NOT drilled at the size and location specified in this document. 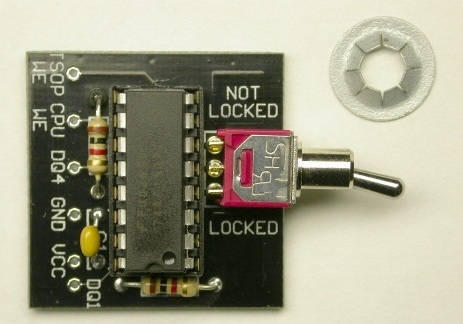 Its hole was drilled a long time before this digital lock PCB was designed and this receiver was used only to provide a visual aid. 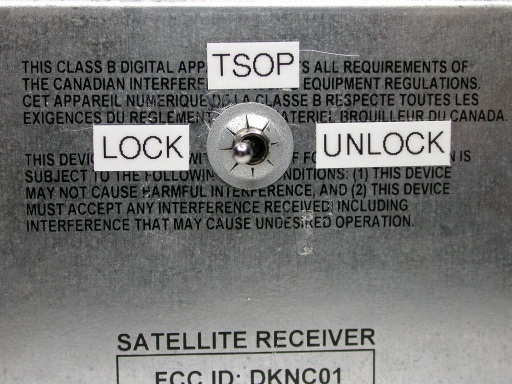 Don't worry if the hole in your receiver looks different from the one in the picture: this is perfectly NORMAL. 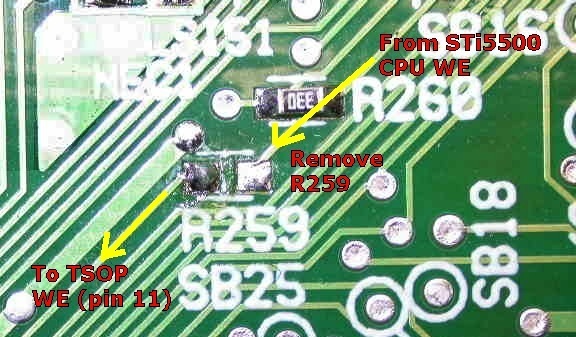 Locate the surface mount resistor labeled R259 on the mainboard using the picture below as a guide. Remove the resistor by heating up one side with the tip of your iron. 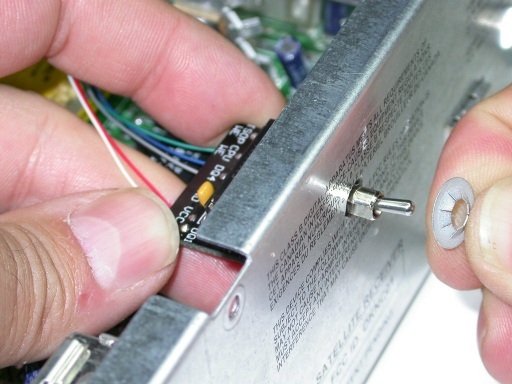 The heat will quickly transfer to the other side of the resistor and the solder will melt on both sides. Then simply swipe it off with a lateral motion of your iron. 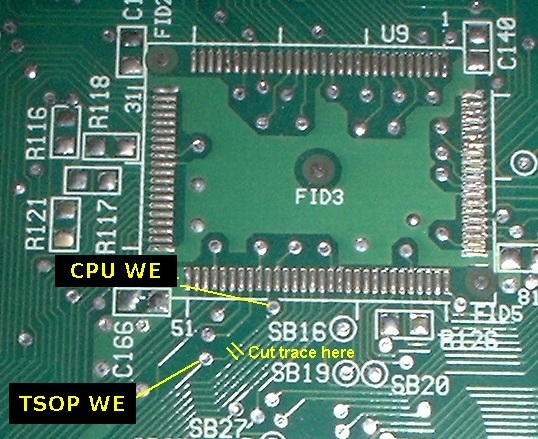 Don't clean up the solder blobs off the pads unless the solder is shorting the pads together: the residual solder is useful because you will have to solder a wire to the left-hand side pad of R259 later on. 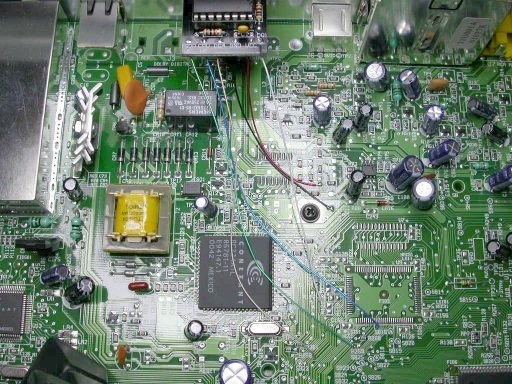 In order for the digital lock circuit to function reliably, it is essential to keep the wires at minimal length. The 6 inch wires already soldered to the PCB at this point should have a bit of excess length and can be shortened. Here's an easy way to trim each wire to its optimal length. Next, strip about 1/16 inch insulation off the end of the wire. It's important to strip only a short length of insulation in case you accidentally nick the wire and have to cut the wire and strip it again. It's also a good idea to keep it short because this avoids the wire from potentially shorting to other pads nearby. Here, a good quality wire stripping tool (like the one shown in the picture below) really helps. Now slightly bend the end of the wire about 1/8" above the insulation and hold it above the pad/hole with a pair of fine long nose pliers. 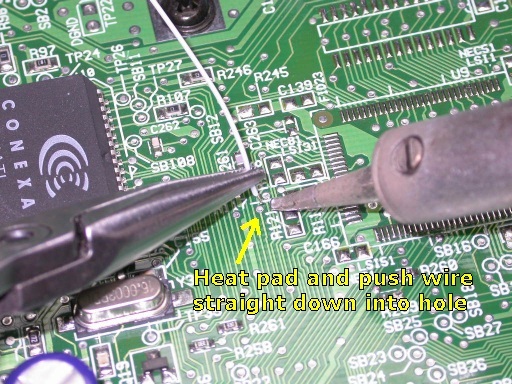 With your other hand, heat the edge of the pad with the tip of your soldering iron and push the wire straight down into the hole once the solder melts. 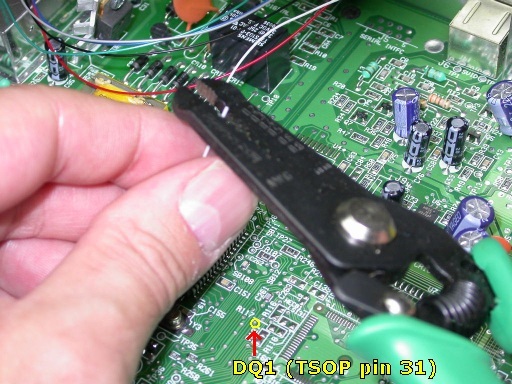 Inspect the solder joint with a magnifying glass to make sure it's good. 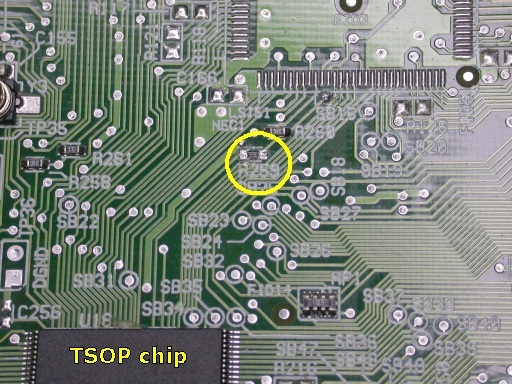 You can also check the solder joint by tugging slightly on the wire. 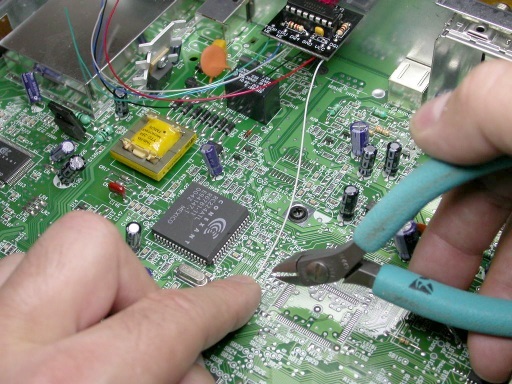 Repeat the operation until all the wires are soldered. 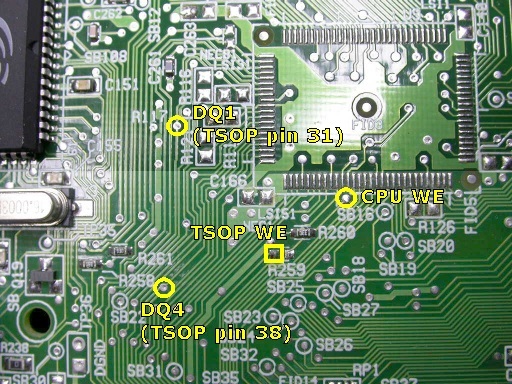 The connection points for GND, VCC and TSOP WE are surface mount pads. In plain English, this means that those pads have no holes in them. For those connections, solder the wire flat on the pad instead. 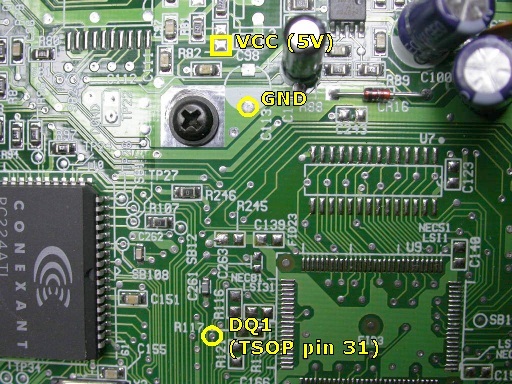 It was recommended by rolesp to use a jumper on the board instead of a switch to avoid problems. 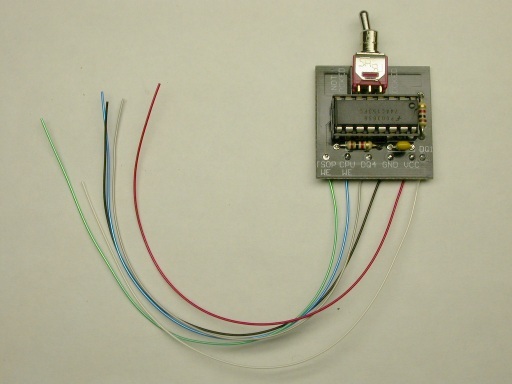 I completely agree in the case where the switch is NOT on the PCB and extra wiring is required (not the case here). 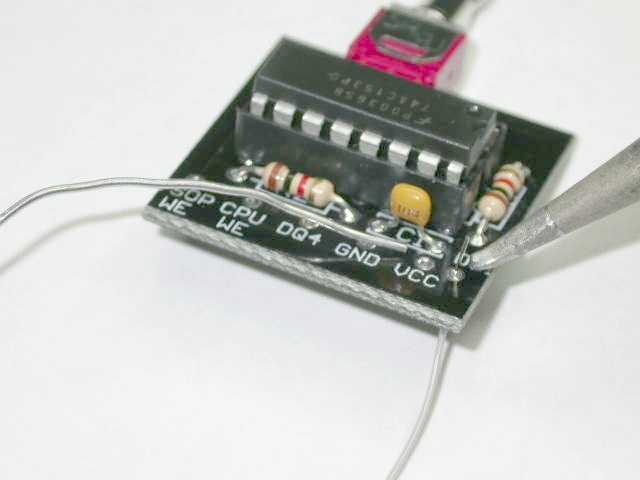 Using a jumper undoubtedly makes the circuit reliable but is kind of impractical since it forces the user to remove the cover of the IRD to access the jumper to take updates from the stream when required. This was not acceptable to me and decided to use a switch instead. So to all those who might have reservations about using a switch instead of a jumper, I can assure you that this board was fully tested and is 100% reliable provided you follow the above instructions to the letter.